Award-winning and intricately detailed documentary on the genesis of early cinema, focusing on one of the craft's most ingenious pioneers. 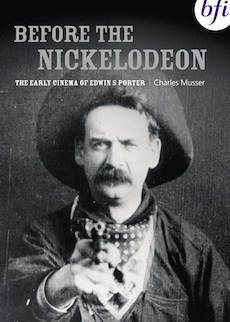 An award-winning and intricately detailed documentary on the genesis of early cinema, Before the Nickelodeon focuses on one of the craft's most ingenious pioneers: Edwin S. Porter. The film is based on the research of the leading scholar of early American film, Charles Musser, who also co-wrote and directed it. As narrator Blanche Sweet (one of D.W. Griffith's Biograph starlets) acknowledges, to study Porter's fortunes is to witness the emergence of the American cinema industry and Before the Nickelodeon charts Porter's illustrious career from telephone operator to projectionist and finally prestigious film director. Porter made over 200 films between 1901 and 1908. His work is often held up as a precursor to Griffith's The Birth of a Nation in establishing the structure and codes of cinematic language and classic filmmaking (Griffith even makes a star appearance in Porter's Rescued from an Eagle's Nest (1908) featured here). Before the Nickelodeon includes excerpts from the hugely popular and imaginative Life of an American Fireman (1903), Jack and the Beanstalk (1902) and Porter's finest, The Great Train Robbery (1903). First shown at the New York Film Festival in October 1982, it was complemented in 1991 by Musser's exhaustive book Before the Nickelodeon: Edwin S. Porter and the Edison Manufacturing Company (University of California Press). Illustrated booklet with an introduction. Credits and biographies of Edwin S Porter, Charles Musser and Blanche Sweet.